When November rolls around I start to give up my obsession with all things pumpkin in favor of the tart flavor of cranberries. 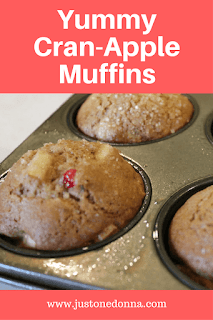 These Cran-Apple Muffins scream fall to me and that makes them perfect to add to your Thanksgiving breakfast menu this year. This delicious cranberry-apple muffin will be perfect for your breakfast table. The combination of sweet and tart is a perfect way to wake up your senses in the morning. A basket of these freshly baked muffins on your Thanksgiving breakfast table will be perfect with steaming hot coffee, a cup of tea, or warm apple cider. Be happy if there are any leftovers. 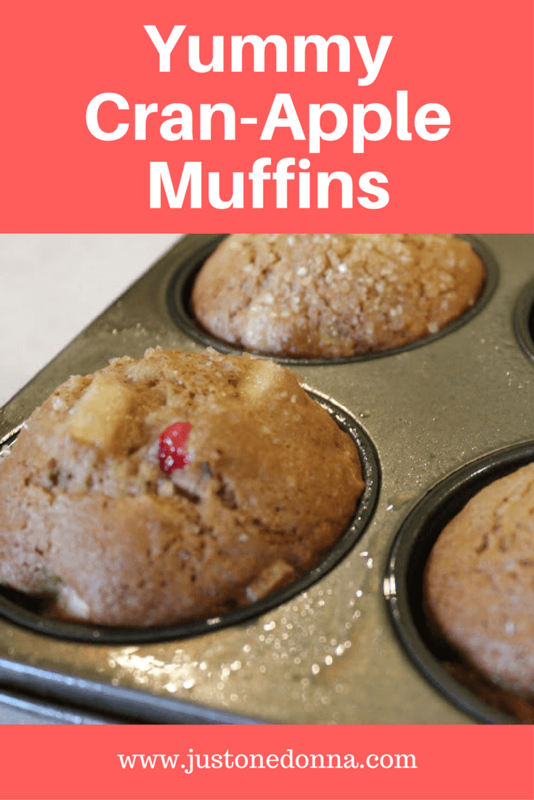 These cran-apple muffins freeze very well when wrapped individually in plastic wrap and sealed in a zip top freezer bag. You'll be grateful for them as the holiday season progresses and you need a quick morning pick me up or a grab-and-go breakfast on a hectic day. Preheat the oven to 350 degrees F. Grease your muffin pan. Whisk the flour, baking soda, cinnamon, and salt together in a medium bowl. In a separate bowl mix together the eggs, brown sugar, oil, sour cream and vanilla until combined. Add the wet ingredients to the dry and mix until just combined. Fold in the apples, cranberries, and walnuts all at once. Don't over mix. Scoop the batter evenly into the muffin tins. Sprinkle sugar on the top of each muffin for a little extra crunch. I like turbinado sugar. Bake for 20 minutes. Cool the muffins for ten minutes in the pan and then remove to a wire rack to cool completely. Thank you for sharing this post with your friends on Facebook, Pinterest, Twitter, and Yummly. I appreciate your support.